First field "Pattern title" intended as short memo or name of pattern. It's not required to specify. This title will be used in all others elements pointing to this pattern. To use this title set the checkbox next to title. The following two checkboxes specify the pattern length in measures. When the first checkbox is set the length of pattern will be defined automatically by the last measure that contain notes (without taking the gate time). It's default setting. Second checkbox defined fixed length in measures. 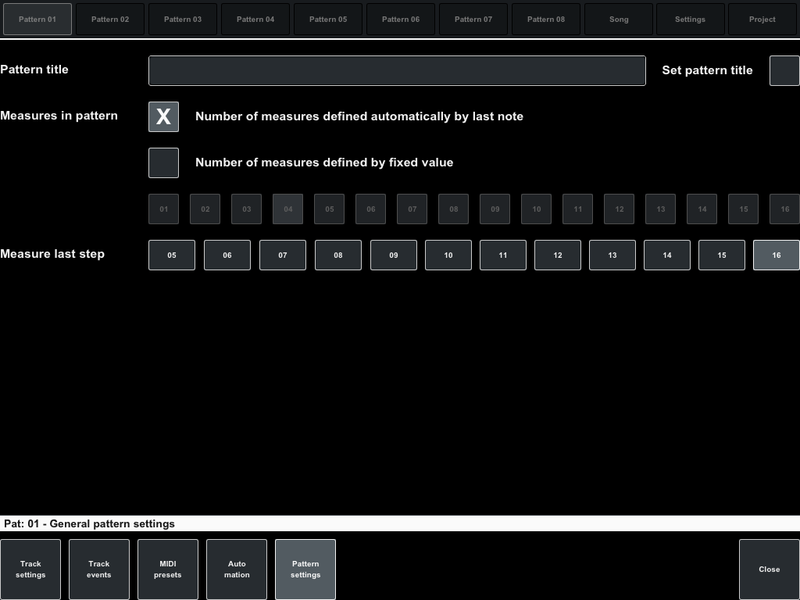 Number of playable measures in pattern can select by buttons from 1 to 16. Measures outside specified length will not play even when contain notes. Please note: Notes and automation events can be present behind last measure however it will not be playing. Also automation events will be hidden in unused measures but not cleared. These buttons allows you specify last step in each measure in current pattern. Ie each measure will play only specified number of steps (cells). So you can define other time signature for pattern. Not only 4/4. As example for 3/4 you need specify 12 as last step. Or 10 for 5/4, but complete measure will consist of two. Please note: So as several patterns can have different last step and all they can play together BPM always calculated the same way for all. That is, regardless of last step duration (in time) of clocks is the same for all. When you decrease last step number unused cells in measures will inaccessible and all data in these cells will be cleared.